What is angina pectoris? Well, this is the medical term for chest pain or discomfort due to coronary artery disease. Angina is a symptom of a condition called myocardial ischemia. It occurs when the heart muscle, or myocardium doesn’t get as much blood and oxygen it needs. This usually takes place when one or more of the heart’s arteries, which supply the myocardium with blood, becomes narrowed or blocked. This insufficient blood supply is called ischemia. 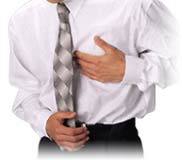 Typically, angina is an uncomfortable pressure, fullness, squeezing or pain in the center of the chest. The discomfort also may be felt in the neck, jaw, shoulder, back or arm. Many types of chest discomfort aren’t related to angina, such as that caused by acid reflux (heartburn) and lung infection or inflammation. Yes, so what is angina pectoris and what actually causes it -- Angina often occurs when the heart needs more blood. Running to catch a bus, for instance, could trigger an attack of angina, while walking might not. Angina may happen during physical exercise, strong emotions or extreme temperatures. Some people, such as those with a coronary artery spasm, may have angina when they’re resting. This kind of angina is called Prinzmetal’s angina. What is angina pectoris? Angina is a sign that someone is at higher risk of heart attack, cardiac arrest and sudden death. Always seeks medical advice even if the pain disappears after some minutes. People with stable angina (or chronic stable angina) have episodes of chest discomfort that are usually predictable. They occur with exertion, such as running to catch a bus or under mental or emotional stress. Normally the chest discomfort is relieved with rest and/or nitroglycerine. People with episodes of chest discomfort should see their physician for an evaluation. The doctor will evaluate the person’s medical history and risk factors, conduct a physical examination, order a chest X-ray and take an electrocardiogram (ECG or EKG). Some people may also need an exercise ECG (stress test), an echocardiogram or other tests to complete the diagnosis. What is angina pectoris is a simple question but the answer should be taken very seriously, as it is a clear sign that something is not quite right.